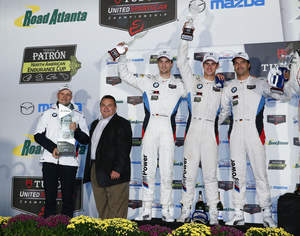 ATLANTA, GA--(Marketwired - Oct 5, 2015) - DEKRA North America, Inc. congratulates #24 BMW Team RLL's BMW Z4 GTE as the winner, for the third time, of the DEKRA Green Challenge Award in the Petit Le Mans at Road Atlanta race held in Braselton, GA on October 3, 2015. DEKRA is the sponsor of the DEKRA Green Challenge Award, which is presented to the most environmentally clean, fast, and efficient GT Le Mans (GTLM) competitor in each TUDOR United SportsCar Championship Race. The DEKRA Green Challenge Award is a centerpiece of the Green Racing partnership between the International Motor Sports Association (IMSA), Environmental Protection Agency, Department of Energy, and the Society of Automotive Engineers (SAE). DEKRA consults with IMSA to review Green Challenge results to ensure they conform to the established scoring criteria. "DEKRA has a long tradition of involvement with elite motorsports events and series, and we are very excited to be partnering with IMSA and the TUDOR Championships," said Donald O. Nicholson, CEO and President of DEKRA NA. "As a leader in automotive emissions and safety testing and sustainability, we are proud to sponsor the DEKRA Green Challenge Award, which recognizes these elite green racers." All of the GTLM class teams competing in the TUDOR Championship must utilize alternative fuels, either E85, E10 or biodiesel. E85 and E10 are made from 85 and 10 percent ethanol respectively and are derived from products grown by U.S. farmers. The GTLM Class is the only class within the TUDOR Series that uses E85. Currently, all but one of the GTLM teams uses E85. These alternative fuels are relevant to the world's automotive manufacturers and energy companies as they develop transportation solutions for the future that are sustainable and have a low environmental impact. The Green Challenge scores are calculated each lap of the race from data provided by the timing and scoring system plus the observed energy consumption -- or fuel used -- of each car from refueling tank sensors. The score for "clean" is based on a rating of each car's environmental impact determined by adding together the greenhouse gases emitted and non-renewable energy (petroleum consumed) by each car during the race. "Fast" describes the average on-track speed of each car compared to the leader (recalculated for every lap) in kilometers per hour. "Efficiency" is measured by how well each car used the energy it consumed based on the car's observed fuel consumption and performance, corrected to the performance profile and weight of the leader. "Much of the interest in ethanol as a vehicle fuel is its ability to replace gasoline made from imported oil," said Nicholson. "E85 fuel also helps reduce greenhouse gas emissions and it is made from ethanol produced in the U.S. from corn grown by American farmers. DEKRA is excited to be part of this new vision for the future." DEKRA also serves as IMSA's Official Technical Partner, operating in conjunction with IMSA during the TUDOR Series technical inspection process of each race car to ensure IMSA regulations and standards are being followed. As unbiased, third-party experts, DEKRA adds credibility to IMSA's technical and safety inspection process. The 2015 TUDOR Championship season opened at Daytona International Speedway with the 53rd Rolex 24 At Daytona. There are 12 races each year across the U.S. and Canada, which attract over a million fans and include racers from Audi, BMW, Chevrolet, Corvette, Ford, Honda, Mazda, Nissan, Porsche, SRT, Ferrari, and Lamborghini. DEKRA has been active in the field of safety for 90 years. Founded in 1925 in Berlin, Germany, the company is one of the world's leading expert organizations today. DEKRA generated sales of around EUR 2.5 billion in 2014. The company currently employs around 35,000 people in more than 50 countries on five continents. DEKRA North America is headquartered in Marietta, Georgia. DEKRA's qualified and independent experts work for safety on the road, at work and at home. Services range from vehicle inspection and expert appraisals to claims services, industrial and building inspections, safety consultancy, testing and certification of products and systems, as well as training courses and temporary work. The International Motor Sports Association, LLC (IMSA) was originally founded in 1969 with a long and rich history in sports car racing. Today, IMSA is the sanctioning body of the TUDOR United SportsCar Championship, the premier sports car racing series in North America. IMSA also sanctions the Continental Tire SportsCar Challenge and the Cooper Tires Prototype Lites Powered by Mazda, as well as four single-make series: Porsche GT3 Cup Challenge USA by Yokohama; Ultra 94 Porsche GT3 Cup Challenge Canada by Michelin; Ferrari Challenge North America; and Lamborghini Super Trofeo North America. IMSA -- a company within the NASCAR Holdings group -- is the exclusive strategic partner in North America with the Automobile Club de l'Ouest (ACO) which operates the 24 Hours of Le Mans as a part of the FIA World Endurance Championship. The partnership enables selected TUDOR Championship competitors to earn automatic entries into the prestigious 24 Hours of Le Mans. DEKRA congratulates #24 BMW Team RLL’s BMW Z4 GTE as the winner, for the third time, of the DEKRA Green Challenge Award at Petit Le Mans at Road Atlanta race held in Braselton, GA, October 3, 2015. Pictured (left to right) are Jens Marquardt, BMW Motorsport Director, Donald O. Nicholson, CEO and President of DEKRA NA, and BMW Drivers Jens Klingmann, John Edwards, and Lucas Luhr.